Do you want to buy Cardano at the best price? 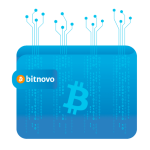 Bitnovo makes it easy! Despite not having the media impact of other cryptocurrencies, projects such as Cardano are occupying a very important place among cryptocurrency. That’s why buying Cardano is a very attractive option. The innovation proposal, and its presence as an alternative to options such as Ethereum, not only make the project very interesting, but, in the opinion of many analysts, is a rival that shares many aspects but, at the same time, is improving them. Cardano (ADA) is a decentralized cryptocurrency, created in 2015, appeared in the markets at the end of 2017. This project is based on the so-called intelligent contracts and decentralized applications, but, made from the most popular programming languages. It is a project that seeks to change the way in which the cryptocurrency is designed and executed. Powered by a combined team of computer security and systems experts, the creators themselves claim to be inspired by scientific philosophies and research-focused approaches. It is an independent body based in Switzerland. It is responsible for supporting user communities, in addition, it allows working with regard to regulation and trade in relation to the authorities. It is a Japanese organization, investor, oriented to new companies. They are also involved in supporting commercial companies for construction in the Cardano blockchain. It is considered a leader in the development of cryptocurrencies and focuses on the development of the Cardano platform. It is not based on the mining dependency algorithm that Bitcoin uses. In this case it is an algorithm called Ouroboros. This algorithm uses a graphic credit model that guarantees maximum security, while allowing developers to implement improvements in the protocols, benefiting their functionality. One of the most appreciated characteristics of Cardano is the flexibility. The algorithm allows the possibility of creating side chains and changes at the same time, in order to create random numbers that offer greater privacy and security. Security is undoubtedly a key element. The Haskell programming language that has the Cardano blockchain, makes it possible for the code to be written in a much more reliable and safe way, because it is a mathematical approach. Also, additionally, it use the CSL, a security protocol to increase user protection. The competition between Cardano and Ethereum is evident. The fight is established in the search to become the main platform to create smart contracts. In this sense, Cardano will use Solidity only as a programming language for the lower applications. This language is used by Ethereum for the programming of intelligent contracts. However, ADA implements a new programming language for its Haskell-based applications. It is a language oriented distribution to developers to be integrated into development processes. The Ouroboros algorithm, is presented as capable of defending against the possible attacks that are affecting the block chain when it is open for development. In addition, the algorithm provides privacy and security to users and is able to create side chains. Actually, we are facing one of the first attempts to create a comprehensive protocol to launch the chain of blocks to the real world. This translates into trying to bring financial systems to sectors in which the cost of implementation became an obstacle. The use of the Haskell language allows the writing of a safe and reliable code, based on a more mathematical method. Also, it is possible to execute formal checks in the code development process. This reduces the number of errors that can lead to large losses. Within the operation, it is important to note how ADA develops two layers. These separate the general ledger from the securities account, causing them to move from one account to another. This separation makes it possible for the design, execution and privacy of contracts to be adapted to specific uses. We are probably facing one of the best projects today. The process of constant improvement makes many experts recommend the purchase of ADA. Betting that the Haskell programming language, more innovative, has already exceeded Ethereum’s scope possibilities. 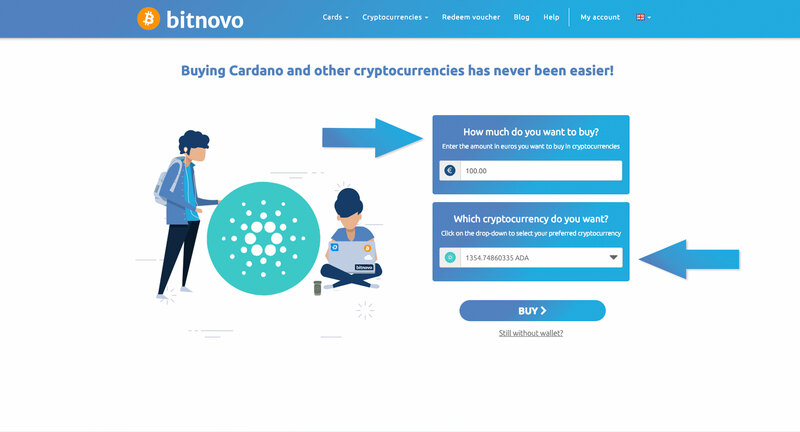 Bitnovo seems to be a great option to buy Cardano. Next we will see step by step how to make this purchase. 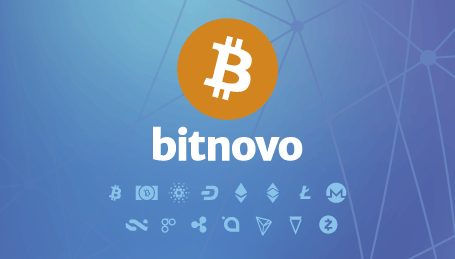 First, from Bitnovo website, we chose the option Buy Cryptocurrencies. In the next step we choose the amount we want to buy. We have chosen 100 euros and in the corresponding tab we chose Cardano (ADA). We click the buy button. We’re almost done. It is very important to have your wallet number. If you do not have it, Daedalus is a good option in this case. Enter your mail, your phone number and select the payment method. 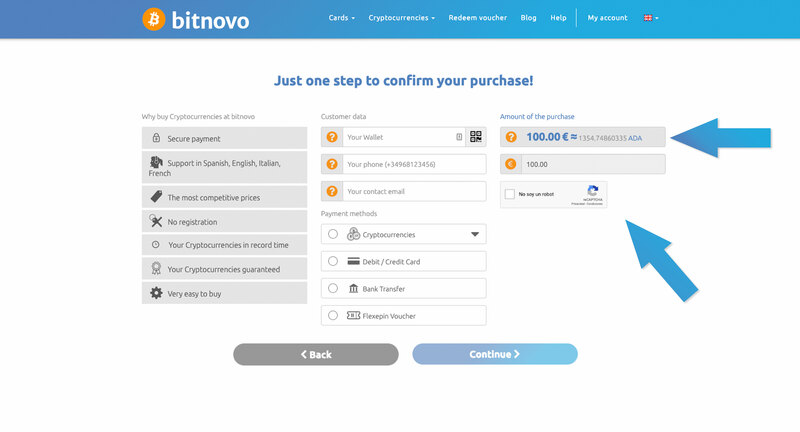 Do not forget to check the amount of the purchase and accept the captcha. Then, simply by pressing continue, the operation will be processed.